Earth n Sea - Bulimba is currently open. Please place your order by adding items to your order. El Supremo Ham, fresh button mushrooms, sliced capsicum, a touch of onion, black olives & salty anchovies. Cruel Sea A lovely mix of prawns, clams, mussels & black olives, with fresh garlic to bring out the taste. Quattro Stagioni (kwutro stajjee onee) A cook's tour of Earth N Sea. Four different corners of Some Like it Hot, Mullumbimby Madness, Hot Lips & Troppo. Something for everyone. Capricciosa (kap-rich-osa) - A classic Italian pizza with ham, pepperoni, fresh button mushrooms and salty anchovies. Mullumbimby Madness At last! A vegetarian pizza with taste! Fresh button mushrooms, slices of capsicum, just enough onion, black olives, fresh garlic, garden fresh tomato slices and your choice of pineapple pieces or chilli sauce. Hot Lips Ham and pepperoni. A certain Sicilian gentleman revealed this simple recipe for putting the heat on your friends. Some like it hot 100% pure beef with our unique blend of spices, onion & chilli sauce. Italy's answer to the Aussie meat pie. Neapolitana Black olives, salty anchovies, garden fresh tomato slices & fresh garlic. Traditional strong tasting Italian pizza. M.N.X. (ham 'n' eggs) Ripper tucker! Whipped eggs & ham. Bacon & whipped eggs also available. Troppo Our now famous ham & pineapple. Big chunks of pineapple and ham. Galliani Tender breast of chicken, slices of button mushrooms with a touch of lemon juice seasoning. Calypso Spicy pepperoni & sweet pineapple. Sweet 'n' sour..... Steams you up then cools you down. The Number Fourtheen When we only had 13 pizzas on the menu, the local lads invented the number 14. Real 100% beef, ham, onion, whipped egg & chilli. Now one of our most popular pizzas! Puttanesca Fresh garlic , dash of chilli, button mushrooms, bacon, olives and capers. Not too much of anything so you get the individual flavours. Apocalypse Now When you can't think of what to order. Go for broke! Ham, 100% beef, pepperoni, sliced capsicum, button mushrooms, sliced onion, chunks of juicy pineapple & prawns. The Green Pizza Spinach, feta cheese, olives, sliced onion & freshly crushed garlic. It's great with jalapeno peppers if you like your pizza steamy! Manuel's Mexican Mexican chilli spices, red kidney beans, sliced onion, sliced capsicum & mushrooms or 100% beef (or both!). Ole! The Satay Chicken Tender chicken pieces marinated in our Peanut Satay sauce, sliced onion & a little spinach. Is this Bali or heaven? Tropical Heatwave 100% ground beef, pepperoni, sliced onion, jalapeno chilli peppers, sliced tomato, juicy pineapple & chilli sauce. For the bold and the daring. This will put the wind in your sails! Hot & spicy! Earth N Sea Massive Meatlovers A combination of 100% beef, bacon, ham, pepperoni with our special BBQ sauce. Total meat munch out. Why not try it with whipped egg? The Margherita Garden fresh slices of tomato, crushed garlic, basil and oregano. A tasty herb combination. Tempting Tandoori Tender chicken pieces marinated in a fiery Tandoori marinade, spinach, sliced onion, lemon juice, pine nuts & feta. If you like it spicy with the right blend of topping then this is the pick. Garlic Bread (Serves 2-3). Crusty and delicious. Will keep everyone going until the main event arrives. Herb Bread (Serves 2-3). Crusty and delicious. Will keep everyone going until the main event arrives. Cheese Pizza Bread (Serves 2-3). Pizza Sauce, Feta & Mozzarella. Why not ask for a splash of Garlic? Pesto & Garlic Bread Pizza (Serves 2-3) A delicious pizza bread splashed with garlic pesto, parmesan and mozzarella cheese. Side Salad Fresh mesculan leaves, cherry tomatoes, spanish onion, cucumber, julienne vegetables, snow pea sprouts, alfalfa sprouts with our unique Italian dressing. Greek Salad Fresh mesculan leaves, cherry tomatoes, spanish onion, cucumber, julienne vegetables, snow pea sprouts, alfalfa sprouts, feta cheese and kalamata olives with our unique Italian dressing. Earth N Sea Caesar Crispy shredded Cos lettuce, bacon, egg, garlic crotuons, parmesan cheese topped with our own Caesar dressing. Earth N Sea Cajun Chicken Caesar Crispy shredded Cos lettuce, bacon, egg, garlic croutons, parmesan cheese topped with our own Caesar dressing & Cajun chicken breast. Carbonara Bacon, onion and mushroom in a rich creamy sauce served fettuccine pasta. Napoli Garlic, Onions, capers, olives & Basil in a rich tomato sauce served with Spaghetti. Bolognese Slow cooked beef, onion, garlic & tomato sauce served with Spaghetti. Marinara A variety of seafoods in a lovely tomato or tomato cream sauce mixed with Spaghetti. Vegetarian Delight A seasonal mixture of pan fried vegetables in Italian tomato sauce tossed with fettuccine pasta. Lasagne Homemade layers of fresh pasta with Bolognese & creamy Bechemel sauce topped with Mozzarella. Served with Napoli & Bolognese sauce. Tortellini Little rings of pasta filled with chicken. Served with a bacon, tomato, mushroom & cream sauce. Thai Chicken Authentic Thai Chicken in a coriander & coconut cream sauce with fresh vegetables on a bed Fettuccine pasta. Troppo Ham and Pineapple. A very popular Earth N Sea kids Pizza. KML (Kids Meatlovers) Chicken, Ham, Bacon and BBQ sauce. Kids Next of Worms (Bolognese) serving of spaghetti with our traditional, hearty beef Bolognese sauce. Kids Tortellini Little rings of pasta filled with chicken. Served with a bacon, tomato, mushroom & cream sauce. Kids Carbonara Bacon, onion and mushroom in a rich creamy sauce. Served with fettuccine pasta. Kids Ricotta Ravioli squares of pasta stuffed with Ricotta cheese. Served with a tomato & basil sauce. 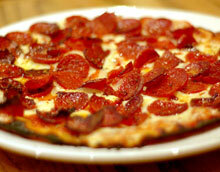 Since 1976, the team at Earth N Sea has been serving up a wide range of irresistible pizzas. So it goes without saying that we have been around the block a few times! Earth N Sea is a family friendly restaurant so feel free to bring in the little ones for a great dining experience. If you prefer enjoying your favourites in the comfort of your own home, simply order them online for pick up or delivery.